Solenoid Locking MechanismMotor Drive Mechanism (Motorized)0 x 90 Deg. 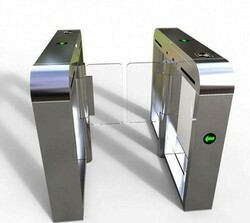 Stop.Magnetic Sensors Stopper.Integration: Will all types of panel/Access Control Readers etc.Case Work/Housing: Stainless Steel 304 grade Mat Finish.Walkway 550 (+50) mmSmooth & Silent Operation.LED Lane indicators for entry exits on top & front.Through put: 20 to 25 persons per minute. Power: 230 VAC Single PhasePower Less than 40 Wats Consumption.Duty Cycle: 100% or continuous useOpening time: 3 to 9 secondsWeight: 60 Kgs (app)Application: Indoor/Outdoor (under canopy)Temperature: -5 Deg. To +55 Deg.Dimensions of Case Work: (H)1020 mm x (W) 1100 mm x (L) 900 mm.Walkway: 550 (+50) mmInternal component: Electroplating.Locking Mechanism: Solenoid locking mechanism.Installation: Easy to install, by anchor bolts on the plane concrete surface. Looking for Swing Flap Barriers ?